As the years go by, are you noticing any unusual developments in weather patterns in your area? Aside from experiencing warmer winters, later falls, and earlier spring conditions, the weather in the Twin Cities has not seemed to have radically altered. But then again, overall climate conditions change so slowly that day-to-day weather patterns don’t seem to make much of an impression. We’ve been rather fortunate—so far. Obviously, this is not the case when weather patterns are considered nationally, continentally, or worldwide. For instance, elsewhere in the U.S. weather patterns are changing noticeably and dramatically. In the U.S. California is suffering a long-term drought, heat records are being broken in various places, including the Northwest and Alaska, intense rainfall is creating catastrophic record-breaking flooding conditions in Texas and elsewhere, stormy weather continues to strike the Midwestern plain states, with Oklahoma City appearing to be an epicenter. And the list goes on. 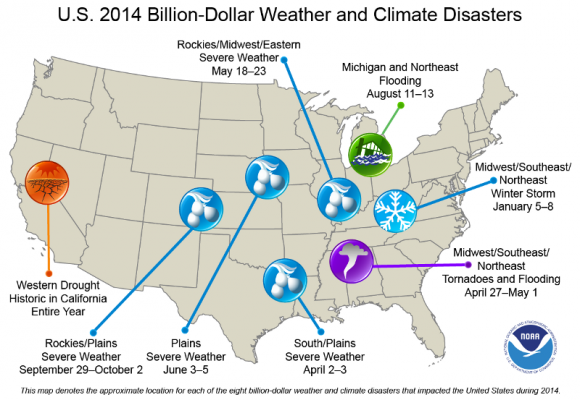 The following chart shows the economic costs of climate change events in 2014. Several articles in this issue address various perspectives about climate change, its ongoing effects and predictions for the future. It’s hard to believe that so many Americans continue denying the reality of climate change. Thankfully, the numbers of deniers are decreasing, as experiential and scientific evidence continues piling up. Kurt Cobb addresses the issue of deniers in Views. Several climate-change articles are included in the News section, one featuring projections about the long-term costs associated with climate change, and another showing how fast temperatures are rising—and are projected to rise throughout this century. A Nature Conservancy article lists “ten unexpected impacts” of climate change, and a Think Progress article explains how climate change is altering our National Parks, where some of the world’s grandest natural wonders are located. Two significant fringe effects of climate change—increased toxins that influence animal diseases, and growing concern about wildfires—are addressed in two articles. The overall tone and substance of these articles raise grave concerns. What’s missing from all articles is any mention of what’s causing climate change. Some mention rising CO2 levels due to continuing worldwide reliance on fossil fuels, an undeniable fact. But very rare in media reporting is there any mention of the primary role of overpopulation as the principal driver of humanity’s combined woes. Based on the research contributions of notable population experts and organizations, it’s past time for world leaders to begin giving serious attention to the overpopulation issue. All reputable population authorities promote the use of humane solutions in managing population growth. Popular measures include promoting family-planning methods and techniques, progressive-oriented education, supportive social and economic incentives, and readjustments in social values, such as pursuing simpler lifestyles and creating ways to serve the common good. At this point climate change cannot be reversed, but it can be slowed, and to some extent mitigated. But constructive measures will most likely not occur—unless worldwide numbers of human consumers are reduced to a sustainable level of around 2 billion citizens by 2100. The projected 9-10 billion humans projected for 2050 will lead to catastrophic consequences for civilization—and for this one-of-a-kind planet we call home. Can we let this happen? Not if we care enough to take action! > Resource Insights: The Faux Insurgency Of The Climate Change Deniers And The Need For Closure (Kurt Cobb). The climate change deniers actually work for wealthy corporate interests opposed to doing anything to mitigate the ongoing carnage of climate change, the most compelling evidence of which is the steady march upward of atmospheric carbon dioxide levels measured at the world’s best-known measuring station, the Mauna Loa Observatory. What the deniers are sore about is that they’ve been exposed and they’ve lost the fight, at least over whether climate change is real and whether humans have the lion’s share of the blame for it. The real problem the deniers are having is that their audiences are getting smaller and smaller. That’s what happens when you don’t have a very compelling argument and the total weight of the evidence is so lopsided against you. > Climate and Capitalism: Planetary Crisis: We Are Not All In This Together (Ian Angus). The 21st century is being defined by a combination of record-breaking inequality with record-breaking climate change. That combination is already having disastrous impacts on the majority of the world’s people. The line is not only between rich and poor, or comfort and poverty: it is a line between survival and death. Many studies, articles, and reports have documented the disproportionate wealth at the top. Rather than overwhelm you with a long list of appalling statistics I will just cite two: 1) in 2015, the richest 1 percent of the world’s population owned as much as the remaining 99 percent combined; and 2) just 62 individuals owned more than the poorest three and a half billion people on earth. If this wealth-gap continues, the 21st Century will be a new dark age of luxury for a few and barbaric suffering for most. > Our Finite World: $50 Oil Doesn’t Work (Gail Tverberg). When oil was over $100 per barrel, human beings in many countries were getting the benefit of most of that high oil price. When the price falls from $100 per barrel to $50 per barrel, the incomes of many people are adversely affected. This is a huge negative with respect to world economic growth. In 2016, other commodities besides oil have a problem with price below the cost of production. Growing demand comes from a combination of increasing wages and increasing debt. If oil prices drop from $100 to $50 per barrel, this has an adverse impact on debt levels. Oil prices need to rise to $120 per barrel or more. We are certainly at a worrying point in history. Our networked economy is more complex than most researchers have considered possible. We seem to be headed for collapse because of low prices, rather than high. > Think Progress: Big Oil Is Terminal (Joe Romm). “Peak oil demand” is the new “peak oil supply” because of climate change and plummeting costs for electric car batteries. It’s increasingly clear that we’re not going to move off of oil because we run out of supply. Rather, we’re going to move off of oil because it is both the economic and moral thing to do. The research firm Bernstein notes that two “existential threats to the oil industry” exist — “climate change” and “advances in battery technology and computing power, which have resulted in a surge in interest in electric vehicles and autonomous driving.” They project the peak in oil demand could come as soon as 2030-2035. China will be the key driver in reversing global oil trends (just as it has been in reversing global coal trends). > Post Carbon Institute: The Boiling Pot (Richard Heinberg). On the surface, things appear normal. The status quo of life in America circa 2016 isn’t to everyone’s liking, but at least the system is still working after a fashion. The stock market is up, and unemployment is down. We’re muddling through. Or are we? Beneath the lid, a pot of trends is coming to a boil. What will the wizards of finance do when things turn ugly again—as they inevitably will, sooner or later? So far, 2016 is the hottest year in history, artic sea ice is the lowest ever recorded, and the energy sector is in disarray and drowning in debt. A pressure cooker needs an escape valve, and this year politics is serving that function for the pressure cooker that American society has lately become. Altogether, the next eight years are unlikely to be as safely corked and bottled as the last. > Peak Prosperity: Grasshopper Nation: Planning For Those Who Aren’t Prepared (Adam Taggart). The vast majority of Americans are not ready to deal with even minor setbacks. Only 37% of Americans would be able to cover an unexpected expense of $1,000 with savings. The remaining 67% would have to borrow funds, cut spending, or use credit cards. And what if an American workers’ ability to save gets further compromised from here? 72% of Americans don’t even have a basic emergency response kit in place should an ordinary kind of disaster strike (power outage, hurricane, tornado, earthquake, etc.). The simple reality is that, if you’re investing your energies towards building resilience against potential hardship, most of those around you likely aren’t. In the midst of your efforts, are you planning for their lack of preparedness? When resources per capita drop below a certain level on Maslow’s Hierarchy Of Needs, civility is thrown aside. Desperate people act desperately. > Zero Hedge: The Structure Of Collapse: 2016-2019 (Tyler Durden). The end-state of unsustainable systems is collapse. Though collapse may appear to be sudden and chaotic, we can discern key structures that guide the processes of collapse. Though the subject is complex enough to justify an entire shelf of books, these six dynamics are sufficient to illuminate the inevitable collapse of the status quo: 1) doing more of what has failed spectacularly; 2) emergency measures become permanent policies; 3) diminishing returns on status quo solutions; 4) declining social mobility; 5) the social order loses cohesion; and 6) Strapped for cash as tax revenues decline, the state borrows more money. > Politico: CBO Warns Of Climate Change’s Budget Impact (Matthew Nussbaum). The Congressional Budget Office is warning lawmakers about the fiscal risks of climate change, putting the studiously non-partisan agency at odds with Republican Party orthodoxy. The report, released as hurricane season begins, warns that hurricane damage will “increase significantly in the coming decades” due to climate change. The agency added that humans are playing a role in fueling rising temperatures and a shifting climate. The CBO report included possible policies that Congress might enact to mitigate the rising costs of increased hurricane damage. Among those was a “coordinated effort to significantly reduce global emissions.” The agency also acknowledged that international action is needed, as U.S. emissions are trending downward as a share of the global total. > Climate Central: The Temperature Spiral Has An Update. It’s Not Pretty. (Brian Kahn). The temperature spiral that took the world by storm has an update. If you think the heat is on in our current climate, you ain’t seen nothing yet. To recap, University of Reading climate scientist Ed Hawkins wrecked the internet a few weeks ago with a revolutionary new way to look at global temperatures. Using a circular graph of every year’s monthly temperatures and animating it, Hawkins’ image showed planetary heat spiraling closer to the 2°C threshold in a way no bar or line graph could do. Check it out. > Nature Conservancy: 10 Unexpected Impacts Of Climate Change (Matt Miller). Droughts. More severe and unpredictable storms. A decline in polar bears. You no doubt have heard about these and other effects of climate change. But a rapidly warming world means many other impacts, both large and small. A changing climate will likely change your health, your sports and even what you drink. For Earth Week 2016, we looked at some of the unexpected potential effects of climate change, for both people and wildlife. They include: 1) worse allergies; 2) more ticks and more Lyme Disease; 3) more diarrhea; 4) fewer Belgian beers; 5) shrinking Bison; 6) wolverines without dens; 7) a longer but more unpleasant golf season; 8) trout taking refuge; 9) King Crabs take Antarctica; and 10) some orchids winning, some losing. > Think Progress: Threatened By Climate Change, National Parks And World Heritage Sites Draw Millions (Ryan Koronowski). Last year, 305 million people visited National Park Service-administered sites, signifying the parks’ appeal to millions of Americans and world tourists. A report released Thursday from the United Nations and the Union of Concerned Scientists found that the threats posed by climate change particularly endanger the unique and fragile places on the planet: World Heritage Sites. Researchers have found that climate change threatens to permanently change some of the most wondrous places on the planet. Not only could there be catastrophic ramifications for the sites themselves, but these changes could also seriously threaten the local economies that rely on the tourism revenue these natural wonders generate. Moreover, a report last month found that nearly half of World Heritage Sites are threatened by harmful industrial activity. > MinnPost: Climate Change Adding Toxins To Crops, As Livestock Trends Create Diseases (Ron Meador). In addition to all the other challenges that farmers face from shifts in temperature, precipitation and severe weather events, the United Nations Environmental Program (UNEP) finds that global warming is lacing their products with elevated levels of nitrates, fungal poisons and other potentially lethal compounds. In conjunction with other human-caused pressures, climate change is also accelerating the transfer of so-called “zoonotic” diseases from animals to humans, with the Ebola and Zika viruses being but the latest headline-grabbing horrors. UNEP groups them into three types: Nitrates, mycotoxins (metabolic wastes), and hydrogen cyanide (prussic acid). > GM Watch: UCSF Presentation Reveals Glyphosate Contamination In People Across America (Detox Project by UCSF). Glyphosate, the most used herbicide in the world, has been found in the urine of 93% of the American public during a unique testing project that started in 2015. Glyphosate, labeled a ‘Probable human carcinogen’ by the World Health Organization’s cancer agency IARC in 2015, has now been revealed to be ubiquitous in the first ever comprehensive and validated LC/MS/MS testing project to be carried out across America. The European Union is currently in the process of putting restrictions on the use of glyphosate due to health concerns, with Member States so far unable to agree on the re-approval of the chemical beyond June 2016. Glyphosate-containing herbicides are sold under trademarks such as Monsanto’s ‘Roundup’. > Huffington Post: The Desperate Plight Of Petro-States (Michael Klare). Pity the poor petro-states. Once so wealthy from oil sales that they could finance wars, mega-projects, and domestic social peace simultaneously, some of them are now beset by internal strife or are on the brink of collapse as oil prices remain at ruinously low levels. In 2016, one thing is finally clear, however: the business model for these corporatized states is busted. The most basic assumption behind their operation — that global oil demand will continue to outpace world petroleum supplies and ensure high prices into the foreseeable future — no longer holds. Instead, in what for any petro-state is a nightmarish, upside-down version of that model, supply, not demand, is forging ahead, leaving the market flooded with fossil fuels. Looking into the future, the demise of petro-states as we’ve known them could have a profound impact on the struggle to avert catastrophic climate change. > The New York Times: Unplugging The Colorado River (Abraham Lustgarten). There are signs that the promise of this great [Glen Canyon] dam and others has run its course. Climate change is fundamentally altering the environment, making the West hotter and drier. There is less water to store, and few remaining good sites for new dams. Many of the West’s big dams, meanwhile, have proved far less efficient and effective than their champions had hoped. They have altered ecosystems and disrupted fisheries. They have left taxpayers saddled with debt. And in what is perhaps the most egregious failure for a system intended to conserve water, many of the reservoirs created by these dams lose hundreds of billions of gallons of precious water each year to evaporation and, sometimes, to leakage underground. These losses increasingly undercut the longstanding benefits of damming big rivers like the Colorado, and may now be making the West’s water crisis worse. > Ocean Conservancy: 2016 Ocean Trash Index (Staff). Last year, nearly 800,000 volunteers collected 18 million tons of trash (equivalent to the weight of more than 100 Boeing 737s!) at Ocean Conservancy’s International Coastal Cleanup. Now, it’s time to see what they found. See stats, infographics and more from the cleanup in our 2016 Ocean Trash Index. > Huffington Post: Miracle On The Potomac: The New Bipartisan Law Regulating Toxics (Steven Cohen). Last week Congress passed the first piece of major new environmental legislation in about a quarter century. A new law regulating toxic substances won huge bipartisan congressional majorities. The new law is far from perfect, but it is a major improvement over the ineffectual 1976 Toxic Substances Control Act. Under that law, only five of the over 80,000 chemicals now in use have been banned or substantially restricted in use. Not much action in four decades. Under the new law, EPA must review all chemicals now in commercial use. The law also allows EPA to require manufacturers to conduct tests of the chemicals without being required to first demonstrate that the chemical causes harm. The new law is also a quiet recognition of the toxicity of the high tech environment we live in. > Ensia: The Number One Thing We Can Do To Protect Earth’s Oceans (Liza Gross). The open oceans cover nearly half the Earth, harbor some of its most environmentally important regions, and provide employment and food security for tens of millions of people. Yet, with conservation bodies powerless to issue sanctions, it’s possible to exploit the ocean’s resources until there are no more resources to exploit. That’s why ocean advocates have been working behind the scenes for years to build biodiversity protections into the law of the sea. Finally, their efforts are paying off. And that’s where the public can play a role. Consumers can influence the fisheries, for example, through the power of the pocketbook, or pressure their governments to enact emission controls on ships, a source of largely unregulated greenhouse gas emissions. > Resilience: Our Renewable Future: Introduction (Richard Heinberg, David Fridley; Introduction to a new book, Our Renewable Future). The next few decades will see a profound and all-encompassing energy transformation throughout the world. Whereas society now derives the great majority of its energy from fossil fuels, by the end of the century we will depend primarily on renewable sources like solar, wind, biomass, and geothermal power. Two irresistible forces will drive this historic transition. The first is the necessity of avoiding catastrophic climate change. The second force driving a post-carbon energy shift is the ongoing depletion of the world’s oil, coal, and natural gas resources. As the energy sources that built the twentieth century ebb, it may be helpful to disabuse ourselves of many assumptions and expectations we have assumed. > Yes! Magazine: As Boomers Retire, Mom-And-Pop Businesses Convert To Co-Op (Keli Tianga). Numbering 70 million strong, baby boomers privately own more than two-thirds of all businesses with employees. This adds up to a potential loss of millions of jobs over the next 20 years as boomers transition into retirement. For many, the notion of passing the family business down to the next generation can’t be counted on. A global study co-authored by Campden Research and Prince and Associates found that only 15 percent of family businesses passed through to the second generation and even fewer to the third. Of the majority of owners who will not be passing the family business on to a relative, many are interested in finding another way to ensure that their employees’ jobs aren’t lost because of their retirement. These are the owners that co-op advocates are trying to reach. > Oil Price: 5 Crazy Energy Ideas (Michael McDonald). Renewable power is still the scrappy newcomer in the energy space – untested, green, and a minor presence overall, but exciting and shaking up the world nonetheless. Some innovative ideas include exploring uses for space lasers, body heat (Mall of America in MN), alcohol, texting, and dung and garbage. > Scientific American: Bionic Leaf Makes Fuel From Sunlight, Water And Air (David Biello). A new device that combines chemistry and synthetic biology could prove key to renewable fuels and even chemicals—and combating climate change. The device uses solar electricity from a photovoltaic panel to power the chemistry that splits water into oxygen and hydrogen, then adds pre-starved microbes to feed on the hydrogen and convert CO2 in the air into alcohol fuels. > The Archdruid’s Report: Retrotopia: The Far Side Of Progress (John Michael Greer). This futuristic story continues—32-years following the Second Civil War. Our narrator, an official representative from the high-tech Atlantic Republic, is continuing to explore various aspects of life in the low-tech Lakeland Republic. He currently is negotiating with officials in finding solutions allowing access to inland waterways and raises a concern about what Lakeland will do when worldwide economic growth returns. Lakeland officials spurn the idea of “progress”, the concept based that problems caused by complexity can be solved by adding more complexity. The more complex technology becomes, the more resource costs rise and systematic mal-investment occurs. In sum, progress is the enemy of prosperity.